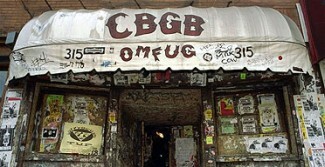 CBGB, the legendary New York night club that spawned some of the most colorful icons of the punk genre—Patti Smith, Blondie, the Ramones—closed last Sunday, the end of an era in American music. Though the music may no longer be as loud as it was during the club’s heyday in the mid-seventies, the powerful influence of the club and the culture that surrounded it continues to permeate nearly every form of popular music today; even the more sophisticated echelons of the avant-garde. A listen to the hipster stylings of contemporary chamber musicians the Kronos Quartet is enough to demonstrate the profound ways that the world of modern art has enthusiastically assimilated the forms and conventions of punk rock. The collision between low-brow pop artists and the artistic avant-garde was the subject of Bernard Gendron’s 2002 book Between Montmartre and the Mudd Club: Popular Music and the Avant-Garde. When we published Gendron’s book we posted an excerpt to our Web site focused on the first wave of punk that crested on CBGB’s dilapidated stage. The excerpt is an excellent introduction to the early history of CBGB, bands like the Ramones and Talking Heads, and the pop and/or art sensibilities that echoed through their music.